Firstly, please take look at the math growth stagnations of the major big city districts of the USA to get the sense of the severity (according to NAEP urban reports on math). Then you may be motivated to take some actions. Scondly, I suggest you to see some visual math growth charts about the charters or top star CMO math performances of the past vs. the projected MMU 0.5-1 impacts here before you continue reading. Please click the following link to view better. http://uslgoglobal.com/districts-vs-charters-vs-cmos-vs-mmu-x-x/ has the following visual data. The more recent analysis 2013-2015 by CREDO and others seem to indicate that the charter math gains have improved a bit past several years, but the readers can see the overall basic picture of what the top charter (networks) can do vs. what MMU can do to completely shake up the math education. Please follow the yellow arrows for MMU1 impact size here. The overall math gain comparisons projections among the traditional districts vs. the decent charters vs. the top star CMOs vs. MMU 0.5-1. The math performances of the largest Charter Networks averages till 2013. Having seen the overall scope of the math achievement scenery changes impacted by MMU series, I would like to propose to 7+ different charter (network) operations as follows. NOTE: I focused more on the Charter Networks here instead of districts simply because I realized that the vast majority of the districts and charters in the USA don’t seem to be really interested in the big innovations and seem to prefer staying with their status quo without a doubt. If you are exceptions, you can contact us to collaborate with. My priority favorite is the first in the list, but if this deems less desirable, you may pick other possibilities to collaborate. Invite me to take the worst half of the math students of your worst math (district or charter) schools in your district (or charter networks) to raise their average of the worst half to that of their best half average during 1-2 weeks. I will take the worst of them (worst schools, districts, or regions) all and let them sky rocket with their math average in 1-2 week pilot studies, not in some years at least. I will first suggest to focus on the grades 3-5 (possibly include the grade 2 as well if you have the capacity) for the 1-2 week pilots. Once this phase is achieved and if the supports and commitments are very good, we may try grades 6-7 afterwards. for the big star Charter Networks (like Aspire, KIPP, PUC, Rocketship, Animo, California Virtual Academy of CA; or IDEA, Yes Prep, KIPP, Uplift, Green Dot, Harmony, etc. of Texas; Achievement First, Uncommon Schools, Success Academy, etc. of NY/NJ area), if they want to collaborate with me because they will also feel the increasing quality math and science teacher shortages as well as the slowing down of your CMO expansions to the inter-cities or inter-states especially because the interstate or expansion of CMOs tend to significantly reduce the math achievements (as I shared for the KIPP and Uncommon Schools in this website for instance at http://uslgoglobal.com/districts-vs-charters-vs-cmos-vs-mmu-x-x/). But a prbolem with the district-size CMOs unfortunately often seems to be that they tend to get trapped in their own closed paradigm of prestige and may be resistant to something that go far beyond even their levels of operations to boost the math achievements. For the CMOs that collaborate with MMU operations initially, we will collaborate harmoniously. If they ignore MMU operations completely, however, then I have no choice but competing against them all and the consequences may inconvenient for both of us. 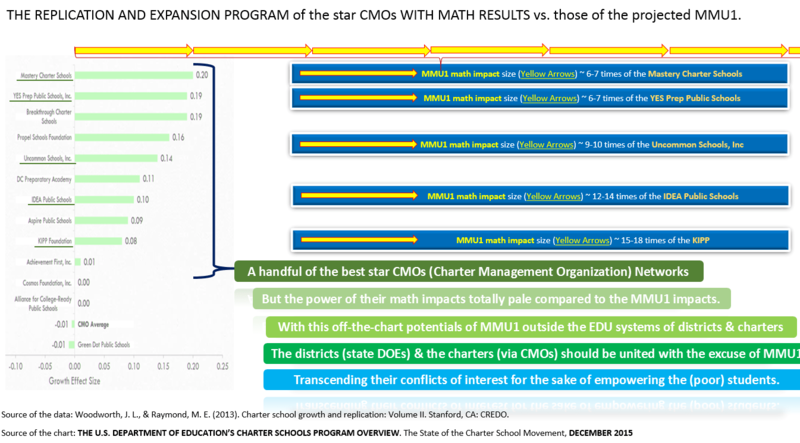 For those who are doubtful, I shared the comparison charts between the top CMOs in the USA (CRDO 2013 data) vs. the projected gains by MMU 0.5-1.
for the individual charters and the small charter networks of less than 5-10 campuses: what I propose for you is to form our own math charter networks so that I can collaborate with the smaller scale charters (networks) that want to boost up their math level this year – not next year to rise above the best of the CMOs in your state. Since I have only one body, I will run the bigger scale online and I will complement or supplement the struggling charter schools and their networks. Even with MMU 0.5 let alone MMU1, you will rise far higher than the best of the top Charter Networks in your districts and states at least for math, starting with the grades 3-5 or 6 (and if the supports are exceptionally good, then to the grades 6-8). For the charters with the struggling or failing math average results (and getting nervous about losing their charters): they may be desperate to boost their math test results and they already know that they cannot rise too fast in the normal modus operandi. Even with MMU 0.5, they will rise higher than the best of the top Charter Networks in their districts and states at least for math, starting with the grades 3-5 or 6 (and if the supports are exceptionally good, then to the grades 6-8). They can run some pilot studies with Lee in April (as early as possible) so that we get the initial results and based on the results, they can upscale for the summer schools or fall semester. For the newly forming charters or charter networks: collaborate with MMU 0.5-2/3-1 operations to give them peace of mind and their saved money can focus more on the more literacy and creativity than much less fruitful traditional charter math education. As such, I will operate as an affiliation math Edu networks, loosely connected and focusing on their rapid math achievement increases. For the virtual charter networks: we may be able to collaborate as most of the virtual charter networks seem to have about 1 year math average learning behind the state or district math averages in general (according to CREDO reports a few or several years ago). We can set up collaborations in such a way that the local charter (networks) that collaborate can use the virtual charter services if some proper conditions are met. At the current rate, the majority of the virtual charter networks may go out of business unless some radical measures are taken. To overcome the quality math/science teacher shortages and transition smoothly and collaborate with the MMU 0.5-1 schemes during the transition time (bet it charters or districts), be it in your schools, CMOs or districts while you can safely transition to the stable recruitments of the quality math/science teachers. To ease the joint collaborations between the districts and charters with the use of MMU 0.5-1 operations as a force outside the establishments. There are many more, but I feel that any of the above-combinations can be useful to those desperately needed or to empower their students massively at a level far beyond the traditional reforms from the districts or charters. Immediate suggestions without delay to the principals and the superintendents of schools and districts: I hope you to invite me to run some pilots (that run for 1-2 weeks) in April and no later than early May because by the end of Mary the semester is over and I hope to run the pilots by end of April or beginning May if possible (and for the summer schools, most students are gone and to get the large number of student participation to get pilots are difficult). Our 2 short youtube compilations of the evidences are here. If you prefer seeing more archived versions, our evidences can be reached from the following links.